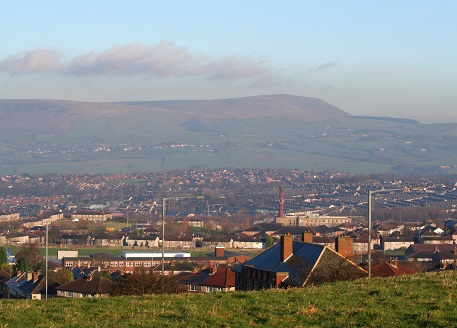 Burnley is a British market town located in the county of Lancashire, around 20 miles north of Manchester. The town was once one of the world's largest producers of cotton cloth and remains a major manufacturing centre today. Figures published in the Telegraph newspaper in 2015 revealed that Burnley has seen overall house price increases of 11% over the past decade. The town is renowned for having the cheapest house prices in the UK, although figures continue to rise with a 7% increase in 2014 – 2015. Burnley is becoming a property hot spot as nearby cities such as Manchester become less affordable. HS3, the planned fast rail link between Manchester and Leeds, has also provided a boost to the area and Burnley’s stock continues to rise in the eyes of private buyers, as well as investors and developers looking for solid property returns. From a history as one of Britain’s major mill towns, Burnley has become a northern hot spot for manufacturing and aerospace. The town won a Government Enterprising Britain award in 2013 for being the 'Most Enterprising Area in the UK' and is home to the Lancashire Digital Technology Centre, which supports and incubates tech start-ups. Burnley has benefitted from numerous regeneration projects, including an aerospace village and a direct Manchester rail link. The ‘On The Banks’ project saw multimillion pound investment in regenerating the Leeds & Liverpool Canal, located at the heart of Burnley. Most recent demographics put the population of Burnley at around 88,000. Thanks to local educational institutions such as the Burnley Campus of the University of Central Lancashire, student numbers are on the rise in the city. Manchester is just under an hour’s drive away and the M6 connects Burnley to Birmingham in just over two hours and London in just over four. With its accessible property market and thriving local industry, Burnley is one of the northern towns earmarked for growth over the coming years.